The Guinness World Record for the largest parade of pickup trucks currently stands at a big 273. This was achieved August 25, 2012 in Ontario, Canada by the Dresden Agricultural Society. On August 3rd, Rural Radio, a new station on Sirius XM, is going to attempt to change that. The event will be held at the Indianapolis Motor Speedway found in none other than Indianapolis, Indiana. Gates open at 10 AM for the public but for parade participants, check-in is from 6 AM to 9 AM. There is no entry fee. At noon, the Classic Tractor Parade will go first and then at 2 PM, the truck parade begins. This all happens after a ribbon-cutting ceremony with executives of both Sirius XM and the Rural Media Group to launch Rural Radio, found on channel 80. The day will be broadcast on Rural Radio as well as televised. Participants in the parade are allowed to bring their families and even decorate their pickup trucks for the event. 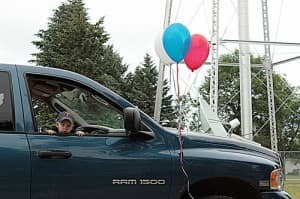 If they choose to decorate their pickup truck, they can possibly win a Sirius XM Satellite Radio along with a one-year subscription to Sirius XM Satellite Radio. They can win these prizes by being the winner of one of any of a number of categories. The tractors will not be allowed not the track itself because of potential oil leaks and will therefore be on the inside of the track. Food will be available, and guests can not only view the parades, but get pictures at the finish line and visit the Indy Car Museum. Penny Gilley will also be performing on stage. Throughout the day, episodes of Talkin Tractors will be filmed. If you are a tractor owner, you can potentially sign up to be interviewed by Max Armstrong and Mark Oppold, but the interviews will be limited. The day will be fun for the whole family from the parades to being able to experience the Indianapolis Motor Speedway and from taking pictures at the Yard of Bricks finish line to visiting the museum. The day’s festivities will end at 6 PM.